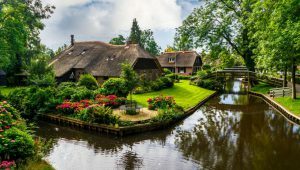 Giethoorn is one of the most beautiful ancient villages of Holland and is located in the province of Overijssel. The village is also know the “Venice of the North”. This village does not have roads so everything is done by boat or by bicycle. – If you are interested in shells, there is a beautiful gallery: The Gloria Maris Schelpen galerie that has a very big collection of many beautiful shells. Is the weather forecast good? Then a visit to the National Park: Weerribben-Wiedend is a must. Visit it by boat and enjoy the beautiful nature of our flat, water based country! The Giethoorn village is a very popular for tourism, so plan your trip well in advance and check the weather forecast ! If it is a rainy day, better bring an umbrella. If you are going for a holiday in the Netherlands, the public transportation is the best way for traveling! Going to Giethoorn: from Amsterdam Central Station i.e. it takes only 2 hours by train & bus. The best ticket would be a Holland Travel Ticket (off peak). With this ticket you can travel one whole day with all means of public transport throughout the Netherlands! If you plan to travel for more days through The Netherlands, you could better choose for the temporary (‘lease’) OV-chipkaart which is the official transportation card for all public transportation!